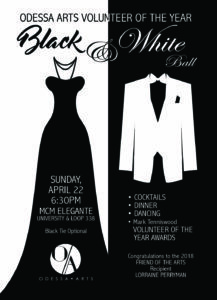 Odessa Arts will honor Arts volunteers at the annual Mark Tenniswood Volunteer in the Arts Award Black & White Ball on Sunday, April 22, 2018 at 6:30pm at the MCM Eleganté hotel. This year’s awards ceremony doubles as a fundraiser for the the Odessa Spire public art project, which aims to transform the old Cloth World sign into a beacon for Downtown Odessa. The Black & White Ball will feature music by Bridger Bolton and Nick Conn, and is hosted by Lupe Zapata, FOX 24 Morning Show anchor. Susan Leshnower – Allegro, Inc.